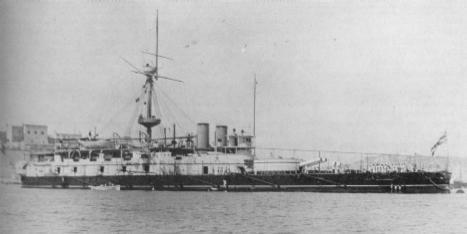 HMS Victoria at Malta in 1890. NMM photograph. Also known as "the Elswick 110 ton gun." These were some of the largest breech loaders ever constructed, although they were of limited usefulness as their very heavy weight meant that only two guns of this size could be carried on each ship. The very heavy projectiles and large amount of powder required to fire them also meant that these guns had a slow rate of fire. In hindsight, this gun was too ambitious for a time when smaller 12 and 13.5 inch (30.5 and 34.3 cm) guns had many constructional problems. "During proof at Woolwich one of the Victoria's guns was found to have bent, and when again submitted for acceptance was put through a long series of trials which brought out other defects. It was therefore rejected and replaced by one specially strengthened, which served as a model for those in the Sans Pareil and held up her commissioning by a further sixteen months. The 110-ton gun was never tested to destruction, and although supposed to have a life of seventy-five rounds, this estimate was often questioned. It was a slow firer, never made good shooting, and proved costly to repair and reline." The differences between the twelve guns constructed were so large that the "Mark I" designation was abandoned and they were known individually by their serial numbers. Number 1 and 2 guns were made of A tube/breech piece - the breech attached to this section - 17 hoops extending to the muzzle, 1 long hoop and 10 short hoops/8 hoops/7 hoops. All parts were made of steel forgings. The later guns were only slightly less complicated. The propellant was in eight bags. Outfit in Benbow was 37 AP, 44 Common, 11 Shrapnel. Other ships had 32 AP, 38 Common and 10 shrapnel. The shrapnel shell carried 2,330 iron shot pellets of 4 oz (113 gm) each. This data from "British Battleships: 1860 - 1950." 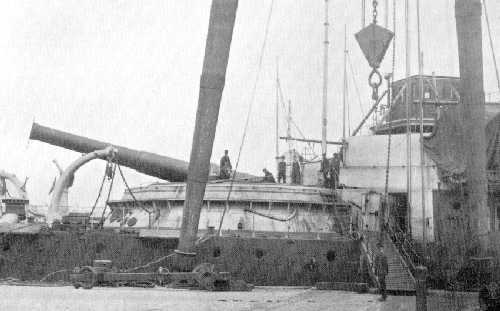 The turret on The guns on HMS Victoria were only 15 feet (4.5 meters) above the waterline while the barbette mountings on Benbow were 22 feet (7 m) above the waterline. In theory, the twin turret had a firing arc of more than 300 degrees but the reality was that the deck buckled during ahead firing and the superstructure was considerably shaken when the turret was much abaft the beam. The blast-free arcs are thus thought to be closer to the numbers given above. Forward 16.25"/30 (41.2 cm) gun on HMS Benbow. Picture courtesy of Bob Cordery of Colonial Wargamming. 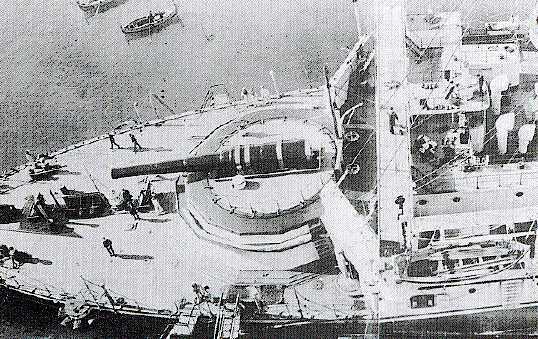 Same gun on HMS Benbow as viewed from above. U.S. Naval Historical Center Photograph - ID Number unknown. Picture of British Ammunition ca. 1900 including 16.25" (41.2 cm). Picture ID Number P01075.019. "British Super-Heavy Guns Part 2" article by John Campbell in "Warship Volume III"